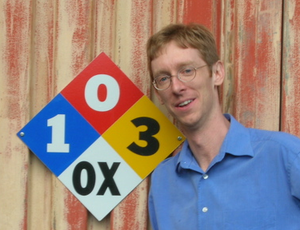 Brian is an Associate Professor in the Department of Biochemistry at Purdue University. There is a Brian Dilkes WikiCV and Dilkes lab page on OpenWetWare. The lab is split between investigating the molecular and genetic mechansims that isolate populations and species and modifying high throughput genomic technology to assess gene function in model, crop, and "orphan" organisms. During my postdoc, with Luca Comai at the UC Davis Genome Center, I began looking at how genome organization can affect plant reproduction and survival. Long term interests include the roles of dosage-sensitivity in plant evolution, the contributions of maternal and paternal effects to seed development, and the molecular basis of hybrid vigor. When not in the lab or working on the computer, I spend the vast majority of my time eating and sleeping. When I sleep I dream of friends, speed, and long lost diesel burning rustbuckets. This page was last edited on 2 September 2015, at 21:22.